As a proud Glock owner, you can say with confidence that you own one of the most reliable, durable and high performance handguns in the world. Military, police, SWAT and special operators around the globe trust their lives with this fine handgun. With the Glock magazine being an integral part of the genius behind this gun, it is always a good decision to stick with Glock factory produced magazines. This ensures that the decades of engineering, testing and proven track record can reduce the likelihood of having a magazine based weapons malfunction. This Glock 17 magazine is a double stack designed magazine capable of holding 10 rounds of 9mm ammo. It is steel framed with a polymer coating and like all Glock magazines is drop free (when you push the magazine release, the magazine will eject from the magazine well). 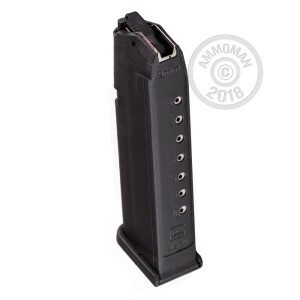 Due to the Glock polymer coating, the magazine can withstand high falls and brutal treatment that would damage a lot of other types of magazines. This magazine will work with either a right or left handed magazine release. This Generation 4 Glock magazine will work with all generations of the Glock 17, 19, 26 and 34 pistols. NOTE: Generation 3 magazines will not work in a Generation 4 pistol if the magazine release has been moved to the right side of the pistol (lefties). NOTE: Not available in areas with magazine restrictions.